Brian Keene posted a few images from the upcoming FEAR, the comics adaptation of three of his short stories. I scripted these for Frequency Press, and now artwork s starting to roll in. 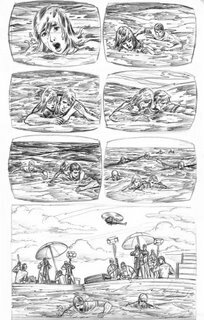 Here’s two small shots of Roy Anthony Amado’s pages from “Castaways.” You can see larger images at Brian’s blog, Hail Saten.